I had always told my father that I wanted to be a mechanic, here in Val di Fiemme, without leaving home. We had no money, so where could I have gone? What I was absolutely sure of was that I did not want to make shoes, like him. My father Virgilio worked at Narciso Delladio’s La Sportiva shoe factory. I wanted to work as a mechanic, that was my passion. So I ended up in a workshop making harmoniums. 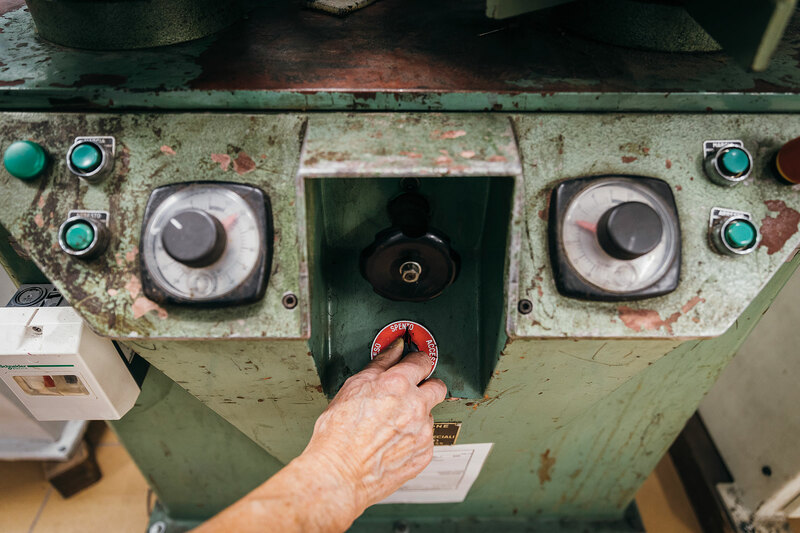 The owner had just bought some new machinery from Germany which was delicate and complicated: he needed somebody to look after and understand it. Somebody to make sure it was always in working order. They wanted smart young workers who were interested in mechanics to start off in the profession of maintenance technician and so my father gave him my name. That’s how it started. I mostly did small repairs and adjustments. After a few years at the harmonium factory I realised that I needed to go back to school if I wanted to make any progress with my knowledge of mechanics and that’s what I did, I went back to studying. During one of those summers I needed to work so I got in touch with my cousin Francesco, who in the meantime had taken over the management for Uncle Narciso at La Sportiva. It was meant to be a temporary job, just a couple of months to scrape some money together. And here I am still in the company after 45 years. It was during the 70s. When I started off as a seasonal helper, I did a bit of everything: general jobs and production, whatever they told me to do. Whatever turned up. At that time production was almost always manual, completely hand-crafted, but it was also a special time: even in the field of mountain footwear the transition towards more industrial and mechanised methods was beginning. It was only that certain workers or heads of department preferred to continue working as they had always done and were not happy to use the machinery. It had been bought to simplify and accelerate the work but soon put on one side and in practice nobody used it willingly. When I asked why, the answer was always the same: because it doesn’t work very well. So, with my passion for mechanics, a little of my spare time and a little out of curiosity, I started to take care of the machinery and get it back in working order. In most cases they only needed to be registered or revised, started up and then maintained, not very much in comparison to my work at the harmonium factory. Certain work when done manually required a very long time, with the machine it could be done much more quickly and above all the quality was much better. The stitching, for example: the San Crispino finish for the full grain leather boots which the machine did was really precise, the stitches were always regular. Perfect. When Francesco - who had always believed in innovation and technology - noticed that the machinery, after my revision, was even improving the quality of the products and the work, he started to insist I should stay, he didn’t want me to go. So, in the end, I stayed, because it became clear at that point that my work had something to do with the production of shoes, but above all with the mechanics. Just how I liked it. When I started in the company in the 70s, climbing boots had to be above all resistant. We used full grain leather, natural waterproof tanning and rigid soles. 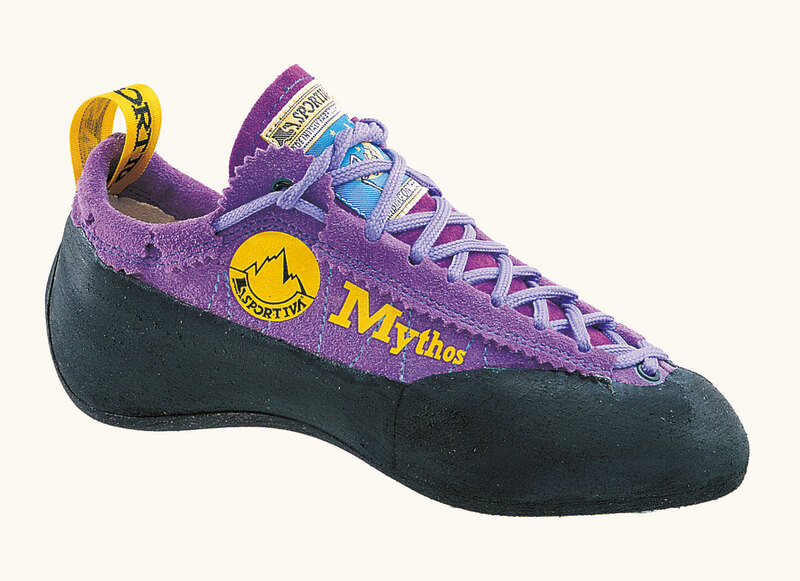 Then the need arose for lighter shoes and also the technique of free climbing was advancing and we were working on shoes that were getting lighter and lighter and on shoes with a soft sole, trying to even make them with a smooth flexible sole. I liked Comici and the idea fascinated me that he would go climbing with very light canvas shoes with a smooth sole. He had opened a route on the Torre Venezia which I had gone to see. At that time, before Mariacher and his purple shoes, our point of reference was Alberto Campanile. We had started to work with him on a Winkler, which was a simple, suede shoe. We had tried to put on a smooth sole. It was early days. You could feel that climbing had taken a new road and that the shoes also had to be adequate. Modern. There was a need to change. At that time climbing shoes did not come out of actual projects. At the beginning we didn’t even design them. We started off from what was under production and modified details to create a new version. We asked ourselves what was the final aim of this shoe and what was there to be improved. And from there we continued with trials, using our heads but also our hands, hammers and feet. We worked with the lasts. What I did amongst other things, besides the maintenance and revision of the machinery, was to listen to the ideas of the alpinists and climbers, who came to us with suggestions, and I tried to transform those ideas into climbing shoes and other solutions which could be used in serial production. Alberto Campanile was the first, then Mariacher, Manolo and all the others followed. The method has always remained the same: after having received the indications, I took my time to see what I could pull out of those proposals starting with the models I already had. The requests were not always feasible, the important thing was to understand the requirement, then the solutions came based on experience and the materials or manual skill. I slowly carried out a few experiments. To begin with I made shoes in my size and tried to apply the idea I had in mind. For example that is how the Kendo shoe was made, I had my wife stitch the uppers. When it looked like I had found something that could work, I called Alberto or the climbers I was collaborating with and made them try the climbing shoes. In the Eighties there was an explosion of climbing shoes and it was the proficiency of Francesco and La Sportiva, ready to listen to the best climbers around which helped them succeed in finding the solutions which improved all the components of the shoes: upper and sole. During the 90s the great revolution was designing by computer. Before, shoes evolved based on previous models. Alterations were made mainly from what already existed, then every now and then there would be a leap forward thanks to intuition or new materials, sometimes new things were born by chance. You tried to do something and instead something else came out, that is how the Mythos shoe became a success. From a certain point onwards shoes started to be developed by computer; it is a different way of designing and thinking of products. You start from the characteristics which are needed to be integrated into the shoe and also from the requests the product manager and the market supply, instead of from the craftsman’s experience. No longer would the product be entrusted to the sensitivity of the artisan, instead it relied on the design, in that way it was also easier to put together the entire work group’s ideas. That was a crucial passage, a u-turn in terms of procedures: the project and designs made by the computer came up with the product’s characteristics, in the lab the artisan had to fine-tune the constructive solution and industrialize it. At the beginning of the nineties the story of climbing shoes which had characterised the previous decade was destined to repeat itself in the field of alpinism. The market was asking for an intermediate boot, with more mobility at the height of the ankle, which could be placed half way between the climbing models and the sturdier mountain models. In those days the most popular models were made with plastic outer shells. The ability of alpinists thanks to the progress which had been brought along by sports climbing had caused a leap forward and what was needed was a shoe for alpinism with which it was possible to climb not only on technical terrain and on rock, but also on ice or mixed terrain wearing crampons. 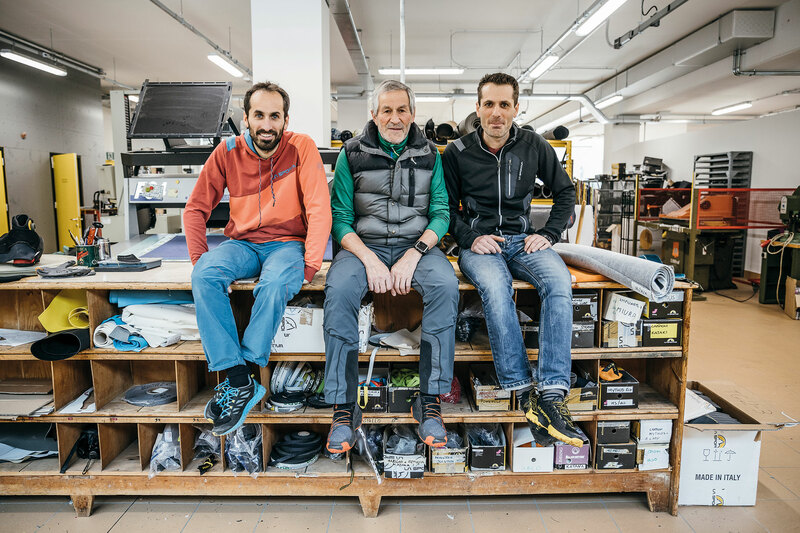 That is how the Nepal Top boots were born, and riding the wave of this revolution other products such as the Trango boots came into being and at that point my sons Enzo and Matteo appeared on the scene and they begin to work for the company together with me. Straight away we had thought of a shoe which was different from anything else which already existed, to start with, crust leather was used, no longer full grain. The midsoles were light and flexible. The edge of the rubber around the shoe had to in some way be similar to the Mariacher shoes: these were the foundations on which to work on. Now all alpinism shoes are made this way, without stitching, with the rubber band and they are all crampon compatible because we have set a standard, but at the time those shoes existed only in our minds. It was neither easy nor quick, but when we managed to fine-tune the Nepal Top and Trango, the results were revolutionary. After those boots everyone started to copy and imitate us, this made Francesco furious, since we had spent so much time finding a solution. What was done really, was to devise a shoe and a type of use, not a product. Our competing companies used our boot, would cut it in two to see what was inside and how it was built, they would then build it themselves to suit their own needs. This was a shame but it also meant that the competition was pushing the market towards our choices and our solutions, this meant that we had an advantage in terms of ideas and technology and in a certain sense this guaranteed that thanks to our innovations, we would always be ahead for a while. I liked working for Francesco, because he gave me space. He gave me freedom and trusted me, he was always interested in what I was doing and how I was doing it but at the same I had carte blanche, without any hassle and he never hurried me. He let me work in peace letting me gradually get to the solution and this allowed me to feel as if this job was truly part of me. It was work of course, but it was also a passion. The satisfaction I gained from work, became the company’s satisfaction, our satisfaction, it was a shared joy and this brought me great pride. This was true both for making boots and climbing shoes but also for the creation of machinery which was needed to produce our shoes. 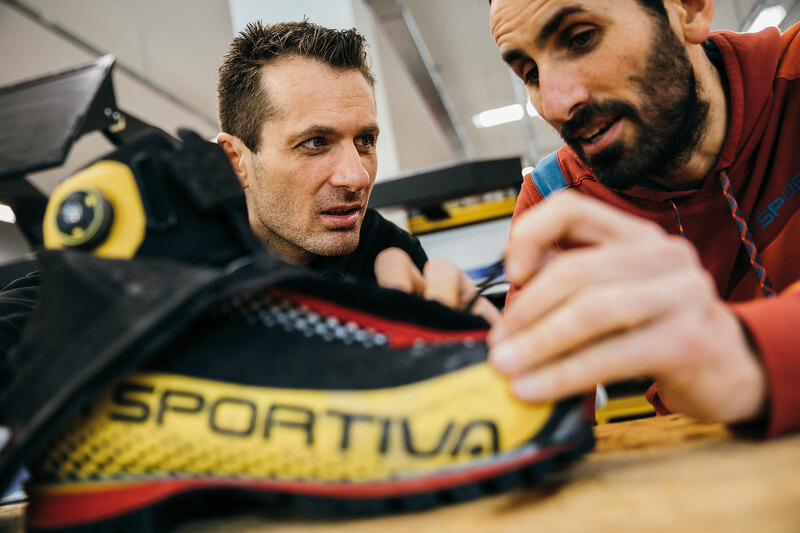 The innovations introduced by La Sportiva do not only deal with the product: we did not only invent types of shoes, we also invented the machinery to make them and which is used by our competitors as well. Having reached a certain point, up to when my sons started working in the company during the 90s, I worked believing that certain solutions or certain machinery should last throughout time, for ever. I believed the same thing for the shoes which I had tried to develop and produce. I then understood that nothing lasts forever and that the specialization, the evolution of alpinism in new specializations always requires new products. The market and technology go forward, and do so quickly, you need to always be ready for the next step. Even if we think that everything can continue working well for many more years, you always have to think of something new. This is what it means to innovate: find new solutions, even when you think you don’t need them.